Fishkeeping has been both an art and a hobby for thousands of years and it’s clear to see why. The scope of beautiful specimen that can be acquired is breathtaking and the pastime is a relaxing and refreshing way to live. The primary subdivisions for this hobby are based on the original dwelling places of the fishes, that is, freshwater or saltwater (marine). 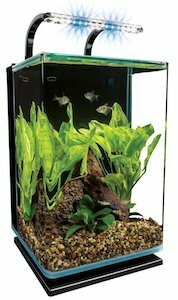 Freshwater aquariums are the more popular of the two for reasons such as price, maintenance and variety. These fish tanks are quicker found in homes, offices and even pet stores due to their affordability, reasonable upkeep, ability to host an array of “community fishes” and the fact that you do not need a degree in aquaculture to enjoy it. 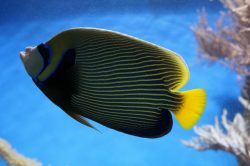 Saltwater aquariums on the other hand, require particular care and are usually more on the expensive end of the price spectrum. Below are some considerations and a review of the best 5 gallon fish tanks available to you. With 5 gallon fish tanks, size is a double-edged sword as you want the comfort of a compact aquarium with enough swimming room for your cold water fish or tropical fish to avoid boredom. 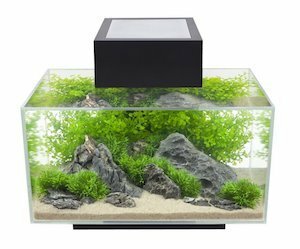 We have compiled the best 5 gallon fish tank reviews for sale that definitely achieve a spacious feel but can still be placed on a small fish tank stand or desktop. It should be noted that stocking these modest-sized aquariums must be done with careful thought. Betta, Endler’s Livebearer, Dwarf Puffer and various invertebrates are often recommended for a 5 gallon fish tank as they can flourish within the space and do not outgrow the limited expanse. Your choice of species will also dictate the temperature of the aquarium and associated accessories. Cold water aquarium fish, like goldfish, are those that thrive in temperatures of about 60 °F (15 °C) and thus do not need a heater but they are messy creatures therefore a superior filtration system is important. 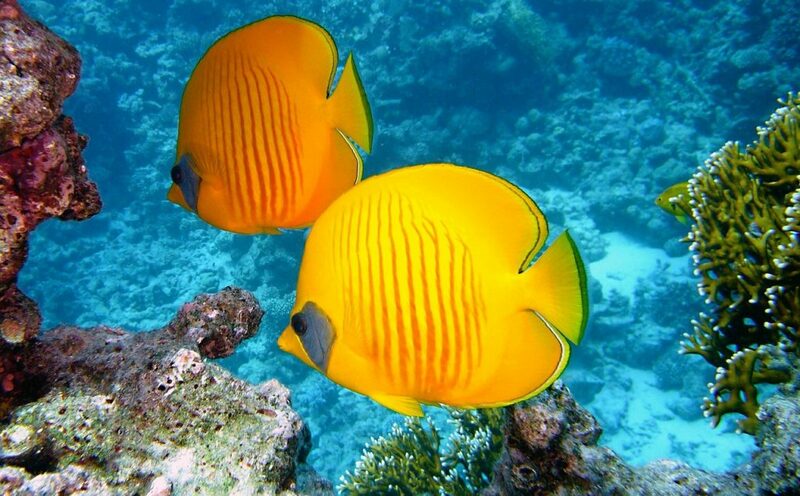 Conversely, tropical fish do require warmth – typically a temperature of 76° to 80°F (25° to 27°C) – but the color variations you can get from these freshwater and saltwater critters vastly outweigh the purchase of a heater. If the kit you choose does not have a heater, you can find one that best suits your needs in our aquarium heater buyers guide. No matter which discipline or aquarium style you decide on, fishkeeping is a rewarding hobby for all ages, from newcomers to seasoned experts. This aquarium measures approximately 11.6 (W) x 11.8 (L) x 17 (H) inches, weighs about 12 pounds and settles very nicely on a small fish tank stand. This kit caters for beginners and those who enjoy a hassle-free system as the setting up process and tidying up process are simple. It has a trim, modern design that tastefully compliments any room. 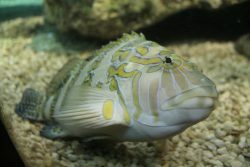 The tank is more pronounced vertically than horizontally which allows it to exhibit your aquatic pets in a striking manner thanks in part to an energy efficient lighting system that gives off the impression of sunlight or moonlight, which is sure to give your saltwater fish or freshwater fish a sense of home. 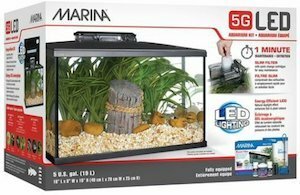 This 5 gallon fish tank kit is armed with welcomed perks such as a cartridge and bio-foam that are easy to replace online, and a three-stage filtration system that works quietly and discreetly in the background to weed out impurities, toxins and debris. There is an adjustable flow filter pump for fine-tuning the aeration within your tank. And to top it off, it has a movable glass lid that makes feeding a joy for all parties involved. On the flip side, there is a narrow housing area for the filter and pump that can be a challenge to reach and while we’re on the topic, the strength of the filter intake is something to watch out for. There is a plastic separator at the back with cutaway holes for routing supply cords but they hinder the panel from laying flat and disrupts the overall slim-lined look of the tank. Also, the water flow can be a bit forceful but with these features it takes a little fiddling around to see what suits you best. This is a variation of the fish tank for sale mentioned above. It measures approximately 11.8 (W) x 11.8 (L) x 16.75 (H) inches and weighs about the same 12 pounds. The design on this freshwater fish tank is eye-catching with curved glass, a wider bearing and dazzling lights that radiate the water from an overhead railing. The marketable difference between the two Mainland Aquariums is the mount for the lighting system. This version has energy saving LED lights positioned in an arched bracket that give the appearance of either daytime (white, sunny look) or nighttime (blue, moonlight look). To summarize the other benefits, it has a smooth set up process and has a three-stage filtration system that does a marvelous job of ensuring your fish friends have a homogeneous environment. The stream of water in the tank can be altered to your own comfort level and the sliding glass top adds an accommodating aspect to the aquarium for feeding and upkeep. However, as previously stated, the strength of the filter suction and water circulation should be monitored. Further, the holes allocated for power cables at the back of the fish tank causes some unevenness to its form and design. This unit measures approximately 17.2 (L) x 10.6 (W) x 6.3 (H) inches and based on the fish tank dimensions, it is spread more length-wise than height-wise which lends itself to the fun of trying out aquascaping (the arrangement of aquatic plants and embellishments in a visually pleasing aesthetic). The edges are lined in aluminum, the base is accented in black and then, to highlight the beauty of this elongated aquarium there is an equally elegant and slender arm across the top with 37 individual LED lights. A priority of this fish tank seems to be discretion as it comes complete with a filtration system that is subsumed by the aquarium design as well as a secret nook for placing a heater. A pump and swivel nozzle effortlessly control water circulation in the tank. Plus, the components of the Fluval kit, namely the integrated foam block, activated carbon and BioMax bio rings, make it ideal for keeping saltwater fish or freshwater fish. It would be splendid for a lone betta as it offers ample space and adequate water flow for these labyrinth fishes. Perhaps, the main snags with this acquisition is the lighting. The LEDs do not support plant life for an extended period and technical issues may be experienced because the lights do not always turn on 100% of the time due to the average durability of the power supply plug. This acrylic tank with hidden LED lighting places the focus on your masterful fish collection through a curved facade. It measures approximately 13.2 (L) x 11.2 (W) x 16.6 (H) inches and weighs about 6.6 pounds. It is a great fish tank starter kit that is straightforward to put together and a treat to behold. It has a mechanical filtration system with an integrated Bio-Bag and Ultra Activated carbon that removes odors, traps particles and maintains the water. It is an environmentally friendly unit with energy efficient LED lighting that is dynamic and can be paired with a low voltage adapter for maximum energy benefits. 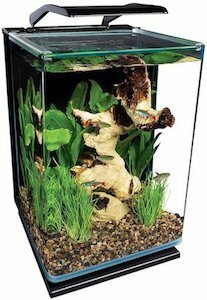 The Tetra aquarium provides comfortable square footage and an accessible switch for adjusting the water flow, and can be utilized as an exceptional freshwater fish tank or saltwater fish tank for keeping petite pets or maybe your exquisite betta fish. It is a terrific option in this regard as acrylic retains heat better than glass but remember to still buy a heater to properly manage the temperature for your tropical fish pals. Unfortunately, the lid on this aquarium leaves much to be desired. The cover could stand to be sturdier and would have greatly profited from a mobile canopy. Also, the filter that accompanies this kit may be slightly too large for this particular model which may lead some owners to spend money on a scaled-down alternative. This is an acrylic aquarium which is something that should be evaluated. These are wonderful for creating custom a 5 gallon fish tank. They do not have to be as thick, they can be light weight and they do not shatter in the same way as their glass counterpart. On the contrary, acrylic is a porous material and scratches very easily. This is a classic, rectangular, glass fish tank that is an optimal aquarium starter kit. It measures approximately 16 (L) x 8.5 (W) x 10.5 (H) and weighs about 12 pounds. It includes multiple add-ons for first time aquarists such as fish food, water conditioner, biological supplements, a fish net and a care guide. A LED lighting system is incorporated into the construction of the cover, making it hidden but effectual. The glow from these lights are meant to appear natural looking and subtle which is a very soothing touch. It is furnished with a Marina Slim S20 clip-on power filter that has quick-change cartridges to reduce the messiness of cleaning up. The filter is one of the biggest draws to this kit as it is powerful, virtually noise-less and takes up little real estate in your tank but with draws there are drawbacks and the hood of this fish aquarium is the drawback. It is not affixed or hinged to the body of the tank and requires you take the whole thing off when you have to move it, which can become a bother. Also, the design of the cover limits where the filter can be positioned. This entry is a bit of a cheat as it is a 6 gallon fish tank instead of a 5 gallon. Despite the extra space, this fish aquarium is a perfect fit for this list. It measures approximately 16.9 (L) x 10.2 (W) x 14.5 (H) inches and weighs about 23 pounds, and is an absolute breeze to assemble. It is a six sided, encased tank with a functional column down the middle that is beyond gorgeous – it looks like it travelled back from the future to show us how far aquariums have advanced. The idea of this design is to give you a near 360-degree view, achieved by covering up the three-stage filtration system (mechanical, chemical and biological) behind an architectural structure. It is illuminated by a mix of 21 white and blue LED lights meant to deliver “bright daytime” and “deep blue nighttime” settings. It is available in three colors (silver, white and black) for a neutral and appealing adornment to your home or office. The kit has good beginner items like a clip-on filter, water conditioner, biological supplements and a detailed guide to get you on your way to learning about aquatic organisms. As much as we adore this cubed aquarium, we do have a few concerns. Firstly, there is an opening at the top of the tank for feeding, cleaning and general access but the gap is small which makes these activities taxing and it makes picking decorations tricky as well. 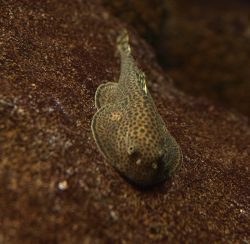 Also, the filter is not the most soundless one in its class and the amount of oxygen exchange in the tank may not be satisfactory for certain fish types. Lastly, if the aquarium is filled to the brim with water then you should be cognizant of it encountering the lights. There you have it. 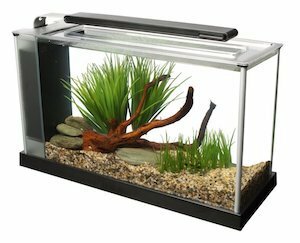 Our list of the best 5 gallon fish tanks for sale (and a bonus entry) offers a practical range of tall fish tanks, saltwater fish tanks and freshwater fish tanks. Most 5 gallon aquarium starter kits do not readily include a heater so items such as these must be acquired separately. Additional supplies like algae cleaning magnets and mini gravel vacuums should be considered to better care for your valued aquariums and pets whether intended for cold water fish or tropical fish. For cold water fish, you should think about buying natural looking sand/gravel to help them feel secure and for tropical fish like betta, you could insert hollow driftwood for them to relieve stress. Of course, filtration is a crucial component to a well-balanced aquarium and the options stated in this article provide exceptional cleaning systems to ease the burden of maintenance. 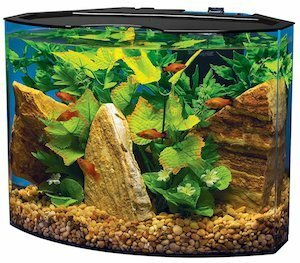 Now the only thing left for you to do is choose your style of 5 gallon fish tank! If you are buying one of the 5 gallon fish tanks listed here, don’t forget to pick food for your little friends. We have guides outlining freshwater fish food, saltwater fish food, and betta fish food. If you are new to the hobby or just need a refresher, have a look at our fish tank setup guide on how to get started with your newly acquired aquarium. Please comment on this post with any thoughts, first hand experiences or feedback you wish to share.